GetResponse Review 2019: Best Email Marketing Software? ​GetResponse is one of the best email marketing service providers you can find. With an affordable price tag, GetResponse provides advanced automation workflows, website event tracking and important email marketing features like A/B split testing & high-coverting email templates. In this GetResponse Review, We'll see if it's the best solution for email automation tool and how it can save you time and effort in lead management. Having second thoughts about GetResponse? With over 350,000 happy customers GetResponse is making email marketing simple and effective. This GetResponse review is a part of my best email marketing service providers research (including others like ConvertKit). In this hands-on review we’ll cover the pros it offers, things it lacks at and how it compares with other GetResponse competitors like Aweber or Convertkit. Please Note: There’s currently a GetResponse Summer Sale going on that brings you the chance to save a massive 40% off your purchase (which is insane!). #3 GetResponse analytics: Want to figure out which emails are performing best? #1. Is GetResponse the right choice for me? #2. What are all the things I can do with GetResponse? #4. Okay sounds great, where can I get GetResponse? I have been using GetResponse since quite a time and the recently introduced marketing automation set of tools has taken this email marketing tool to another level. With GetResponse you don’t need to be 100% there at your business. The process is pretty much auto-completed so you can concentrate on other aspects of lead generation rather than sending and typing each email to every signup. In this GetResponse review, we will see how GetResponse is at advantage with other email marketing tools in the small business sector. GetResponse recently introduced an incredible feature called “marketing automation”. 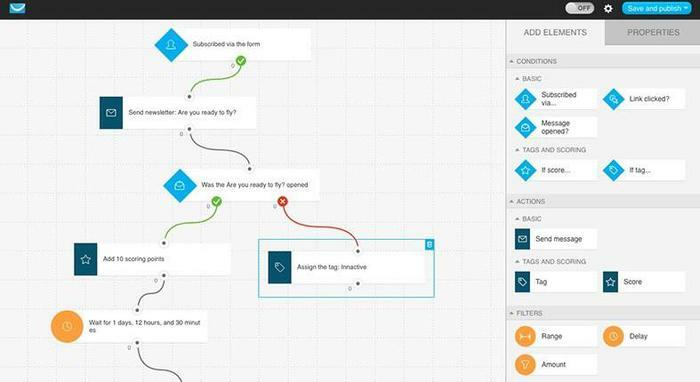 You may now ask, “what exactly is marketing automation?”. It doesn’t matter what size of your website or online business is, we are all looking for “automated strategies” which allow us to save money and more importantly time. With automation, you can earn more with fewer efforts on the actual funnel. There are already automation services being offered by HubSpot, Marketo, Infusionsoft etc but they are really expensive. Here’s where an affordable marketing automation tool like GetResponse comes into place (it’s both inexpensive and effective). GetResponse marketing automation helps you automate your marketing efforts based on your customers actions and conditions. Recommended Reading: Read my Grammarly Review to see how it can help you write better English and win business proposals! Most email marketing software tools don’t allow you to automate your email lists. But GetResponse has the ability to do campaign automation. They use if-then logic to automate your email list campaigns. For instance, if someone clicks on one of your emails, you can then send those people your promotional stuff. This works like a charm and it has two major benefits. One is you are not bombarding your whole email list with the promotional stuff. The other is you are increasing your conversion rates by sending emails to targeted people (this is also known as “action based marketing”). Let me tell you more about how it works in general. If a visitor subscribes to your email list then you can send a welcome email immediately by using GetResponse autoresponder. Then, you use can the same if-then logic to send future emails to your subscribers depending on their behavior. Manage all email marketing campaigns and reporting with automation. Easy to use drag and drop interface: GetResponse uses drag and drop editor which makes it easy for anyone to create emails within seconds. If you want to create an email campaign with GetResponse, all you need to do is to click on “Create Newsletter” from the dashboard, pick an email template and start writing. You can drag images, text, blocks or social media icons to your emails copy. Here’s the screenshot of the dashboard. and then the step by step guide to create an e-newsletter with GetResponse. Once you click on the “Create Newsletter” button, it will take you to the next step where you will see this. Instead of picking the “HTML editor” option, click on “Drag and drop email editor” option to create emails real quick. Once you click on the drag and drop editor, it will ask you to enter a subject line for your email. Write a captivating subject line to improve your open rates. You will then see a list of email templates, simply pick one among to them start creating emails. Access to 500+ templates: GetResponse has over 500 stunning templates which you can use to create email newsletters. 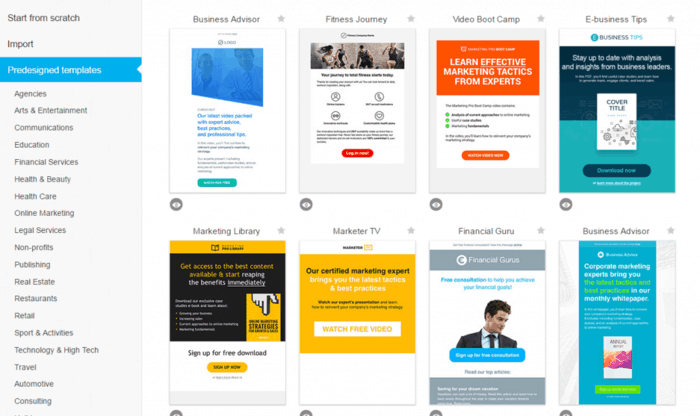 It doesn’t matter what niche you are in (be it marketing, fitness or educational), GetResponse has all the email templates. Pick any one among them and start using drag and drop editor to create email newsletters really quickly. It’s as simple as that. Access to thousands of images: We all know an image is worth a thousand words. Is it really possible to use images in your emails? Yes, of course when you use GetResponse. They also give you access to over 1000 beautiful and royalty free images. What else could you ask for? The best autoresponder software in the market: An autoresponder is what you allows you to send emails to your subscribers automatically. Creating an autoresponder series is extremely easy with GetResponse. Then give a try to GetResponse A/B testing. You can create 2 or more different email subject lines and easily find out which one is performing well among the two. A/B testing on your emails also helps you quickly increase your email open rates, click through rates and overall conversions. You can further leverage A/B split testing to test 2 or more versions of entire email copy and much more. They also have a feature called “one-click segmentation” that allows you to segment people who did not engage (click, read or perform what the CTA intended them to do) with your newsletter. This is very essential in a typical autoresponder sequence so that you can send these subscribers another set of email aimed at converting them to do what you intended, rather than pushing them to the next buying level. We talked about A/b testing but with this feature you can test two different versions of your email campaigns and see how they performed against each other. This is a good way to see which email copy or what offer did entice your readers to take action over your mails sent. 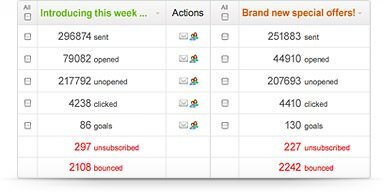 GetResponse email analytics helps you to set automatics reports that you get like every 3 days after each email campaign is published. This will be delivered to you via mail that you don’t need to check back in for the email stats. You can also track the ROI you got for your email campaigns by asking GetResponse to track the number of sales your emails brought to your website. This is done by adding a mini tracking code on your website. If you are running a small business and looking for fastest, cheapest and highly productive ways to boost your business and grow your list, webinars is for you. Webinars which are also known as web based seminars used for building email lists, increasing traffic and sales. You should definitely check out this 60 second video on “Why Webinars” and what you are missing out if you are not doing webinars. Webinars convert REALLY better. That’s the reason why almost every influential marketing expert is doing frequent webinars these days. Neil Patel, Pat Flynn, Brian Clark are few of the marketing experts who are using webinars to take their conversion rates to the next level. Here’s where GetResponse comes into play. As I said earlier, it’s the perfect all-in-one online marketing automation platform that also allows you do webinars. Creating webinars with GetResponse involves in 3 simple steps. Let’s talk about them in detail now. #1. Naming your webinar: Create a URL for your webinar by using a powerful title. Also include at what type the webinar is going live. Also make sure to pick the right times to send reminders to your participants (usually before a day, week or an hour etc). #2. Creating your webinar: Fortunately GetResponse webinars features has a collection of pre-designed webinar templates which you can use to create webinars within few seconds. Just pick a template and start editing as per requirements. As it’s a drag and drop editor, you won’t find it hard to make changes to your webinar registration pages. #3. Publishing your webinar: You can either publish your webinars right away or schedule it according to your timings. You will have 100% control over the number of reminder emails your registrants receive. You can also include social sharing buttons on your webinars using GetResponse one-click sharing options. 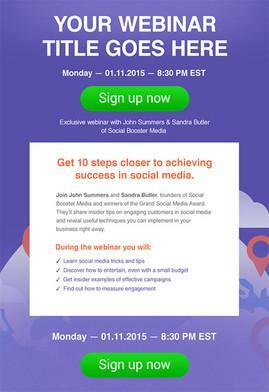 Here are few important things you can do with GetResponse webinars. Include whiteboards, charts and polls. You can also include chat section to engage with your registrants. You can see your webinar data instantly. You can also see how long the webinar lasted and how many your registrants participated on your webinars etc. So there you go. 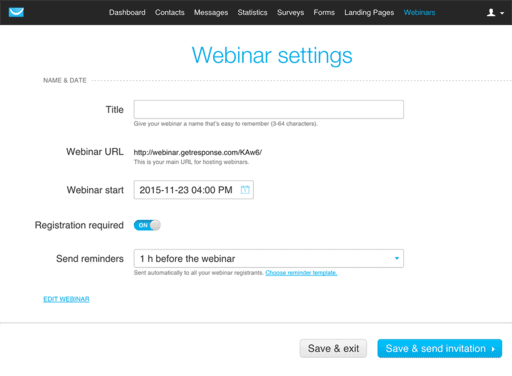 GetResponse helps you create webinars within a few minutes even if you are a complete newbie. You are not only saving a lot of money but a lot of time. Landing pages, sales pages, squeeze pages – whatever you call, they are designed to increase your overall website conversions including sales. Unfortunately creating landing pages used to be either a tedious job or too expensive but only until the arrival of GetResponse landing page builder. Yes, with GetResponse you can also create high converting landing pages within seconds. And you don’t have to rob a bank as their landing page builder is cost effective which is also a part of their marketing platform. Publishing a landing page is really easy and within 3 steps you can do it (no coding skills need whatsoever). Pick a template: There are over 100 beautifully designed landing page templates are available in GetResponse repository. Simply pick a landing page template that suits your marketing needs. Customize your landing page: You will have access to GetResponse drag and drop editor so you can customize your landing pages with text, various colors, images etc. You can literally edit any part of the page you are in. It’s that simple. Publish it with just ONE click: You can publish the landing pages you create with GetResponse landing page builder wherever you want. You can publish them on either your own websites or you can also use GetResponse free web hosting platform (you will get a random link and you can use it anywhere you want!). The GetResponse landing builder includes the following features. Are you convinced that GetResponse is the perfect all-in-one marketing solution for your online needs? Then, why not give a try to it ? You might have a question in your mind now. Why should I pick GetResponse when I have too many alternatives? That’s a great question. Here are few of the most popular alternatives to GetResponse. We will discuss about their features along with the pricing briefly. MailChimp: Although MailChimp is free for first 2000 subscribers but as your list grows you will need to pay more than GetResponse and it clearly lacks a lot of features including the ability to do webinars, creating landing pages, importing etc. Mailchimp isn’t an automation tool at all. Hubspot: Hubspot is the #1 industry leading software for email marketing. But you can’t do too many things with it and it has so many complexed functionalities. Moreover, it’s too expensive when compared to GetResponse. Their basic plan starts at $200 per month whereas GetResponse starts at $15 per month. HUGE difference. AWeber: AWeber has great features and it is widely used worldwide for email marketing. But it lacks a lot of things when you compare to GetResponse and GetResponse has the better pricing, functionality, deliverability rate and the ability to do almost everything with email marketing. iContact: Although it has a lot of great features but it has a poor interface when compared to GetResponse. Now you know why GetResponse clearly wins the race when compared to its competitors. That being said, here’s a quick overview of GetResponse pricing. GetResponse currently has 3 pricing plans. Up to 1,000 subscribers: $15 (‘Email’) / $49 (‘Pro’) / $165 (‘Max’). Right now, there’s a GetResponse summer sale going on which gives you a rare chance to save your getResponse deal with 40% OFF. You save 40% if you avail the offer. I’ve my eyes on the offer and will remove this section as soon as the deal get’s over so make sure you avail this while you still can. And in you want to try GetResponse out prior to committing any billing, you can do so for free by clicking the link below. If you wan to compare MailChimp with GetResponse you should do it with the paid version of MailChimp since the free version doesn’t have automation and other high-level features like landing page templates etc. With the paid version compared MailChimp’s pricing is way too high for what it offers. Moreover, the marketing automation feature that GetResponse recently announced is something I have never heard of with MailChimp. Here is the detailed comparison of GetResponse vs MailChimp that I recommend you to read. With aweber being also one of the top email marketing services out there, they offer exact or equal services as GetResponse does. But recently, the level of automation GetResponse has brought with it is not yet addressed by aweber. With these marketing automation facility, you can categorize lists, send automatic emails to non-openers and a separate campaign to your email clickers so that they buy. Similarly you can automate upsells to buyers or even subscribers and you don’t have t appoint someone to do this for every new addition to the list. The automation campaign sends it to every new lead that goes through different funnel based on the triggers you’ve set. 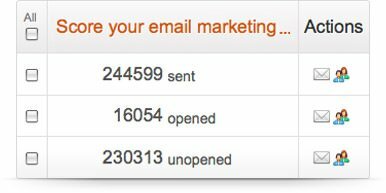 This level of automation is absolutely necessary if you manage big emails or subscribers/customer base. In case of deliverity, Aweber has a slight better deliverity rate than GetResponse has. But the emails sent from GetResponse do have a higher open-rates which somehow manages the gap. NOTE: With aweber, you have to pay for even unsubscriber email address until you remove them manually (yes I just said that) and if you have multiple lists (like suppose a reader subscribed to two of your content updates on your blog, he will have two email addresses on two different lists) then you have to pay twice for those email address with aweber. GetResponse, however only counts active subscribers and has advanced monitoring to count multiple instances of same email id as one so that you pay once for each subscriber. So choose wisely! If you are a small business owner, blogger or marketer, you know how important to build and grow an email list. Making money from your list requires you to do a lot of things including sending autoresponders, marketing automation, A/B testing and a lot more. Here’s where an all-rounder online marketing platform like GetResponse comes into handy. Did you know that email marketing has the highest ROI when compared to other platforms such as social media, banner ads or SEO? Email marketing gives the highest ROI at $40 for every $1 spent . That’s A LOT! That’s the reason why almost every marketer says the money is in the list. And they are not wrong. If you are not building an email list in 2019, you are leaving a ton of money on the table. You can automate your email marketing efforts and a LOT more. No, when you compare to GetResponse competitors, it’s really cheap and offers a lot of value to automate your online marketing efforts. You can find more details in the pricing section mentioned above in this article. GetResponse offers a 30 day free trial which you can pick from here . GetResponse has native apps for both android and iOS so you can send, track and monitor your email campaigns with ease. GetResponse has been an early adopter of technology and so it has been a favorite of bloggers and marketers who do more with less. GetResponse has been the favorite email marketing tool of many pro marketers like Neil Patel and none other than Peep Laja of ConversionXL.com. Here is a small video about what Neil Patel has to say on his GetResponse experience. Building and growing an online business is not easy. It takes a lot of time, efforts and money. Email marketing is the ONE thing that’s absolutely critical for any small business. But finding the right email marketing software is difficult as there are so many options out there. Make sure you are NOT spending on expensive products when you are just starting out. This is where affordable all-in-one online marketing platform like GetResponse comes into handy. It is fully equipped with all the marketing features you need to automate your email marketing campaigns ranging from autoresponder to split testing to creating stunning landing pages. If you want grow your email list and still save time and money on your email marketing campaigns, give GetResponse a try and you won’t regret the decision. Do you have any questions regarding this GetResponse review? If you find this article helpful, please share it with your friends so they can benefit. Do let me know your thoughts in the comment section. If you are looking for an easy-to-use email marketing tool that is free to start and great as a email marketing automation tool, GetResponse is your thing. Use it to create simple newsletters, make advanced automated campaigns and create webinars that convert. If you are looking for an easy-to-use email marketing tool that is free to start and great as a email marketing automation tool, GetResponse is your thing. Use it to create simple newsletters, make advanced automated campaigns and create webinars that convert. I was trying to get some email plugin for my blog and landed on some article that was talking about top 10 email providers. However, i started searching reviews on GetResponse and optinmonster. I think i should try this plugin for my blog! Thanks for sharing such clear review. GetResponse is seen on many websites. I think I better use it for my business for a while. I am currently using the free Mailerlite plan, let’s see how it goes. I am specially more excited about the GetResponse Webinar feature. Thanks for the detailed review on Getresponse, You have addressed all the details I need to know. If you are an affiliate marketer or blogger, it’s important to build an email list to make your blog profitable. Thanks for this Detailed Review. The importance of having an active email list is undeniable for any business. However, not many good email marketing softwares are there, considering the needs and constraint of the SMBs. GetResponse seems to fill the gap and help them in managing their email marketing campaigns effectively. Your review of the software is very in-depth and easy for readers to take the right decision. Thank you for sharing. Take care and have a great start of the week! This is a wonderful review and very detailed. Especially I like the top summary part which is clear enough for quick readers. I heard about a lot of Getresponse, but yet to try. Email list building is a crucial part of online business. I have to put more effort to build an email list in the coming days. Thank you for very much for sharing this useful review of Getresponse. Loved your review about GetResponse. I was thinking to get it but had double thoughts. Seems it’s good enough for my ESP. That’s a very thorough review on Getresponse and you have really covered all bases. I strongly believe your article will help people in their decision making. Thanks for the useful information I will come back to your website to learn more about email marketing service providers. Keep up the great work. Wishing you great success!